Spalding DeDecker (SD) provided surveying and engineering services for this 20-inch crude pipeline over a 40-mile route. The route included nine county road crossings and two major river crossings. SD designed directional drill bores for these crossings. The route crossed 38 properties that were each surveyed to determine the property lines and develop the easement documents. In addition to determining the property lines, SD plotted hundreds of existing pipeline easements that crossed or paralleled this new pipeline. 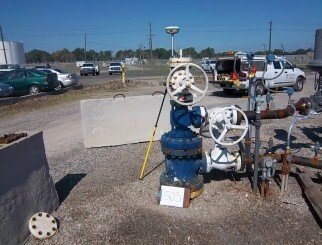 Our field crews mapped these existing pipeline locations using underground pipe locating equipment and GPS. The depth of each pipe was recorded to enable the design team to maintain a safe clearance at each pipeline crossing. Once a pipeline route was determined and easements were acquired, SD mapped the entire route utilizing GPS surveying techniques and UTV’s. The topographical data was utilized by our design team to engineer the pipeline and develop plan / profile sheets. While the design team was engineering the project, the field crews retraced the 40-mile route with an archeological expert, environmental expert, and an endoscope team. The surveyors assisted these experts by showing them the route and mapping any areas of concern for each of these experts. This additional data was added to the final plans along with notes pertaining to archeological or environmental concerns. The endoscope crew was able to use their advanced underground locating equipment to find any unmarked pipelines or flowlines along the route. The end result was a very comprehensive set of construction plans that could be relied upon by the contractor. Throughout the 40 miles of construction, only one unknown flowline was found. This unmarked flowline was constructed of fiberglass pipe, which explains why it was missed by the endoscope team. Fortunately, it was abandoned and dry, so the project proceeded with only a minor delay. After the plans were approved, SD staked the entire route for clearing, fence gaps, and gates. While two survey crews marked the clearing limits for the 40-mile route, another survey crew followed the clearing crews to re-stake the easement limits, so the top soil could be stripped and stockpiled in the temporary easements. Once the route was stripped, SD staked the pipeline route every 100 feet along with all deflections, pipe crossings, valve locations, and horizontal drill locations. As the trenches were dug and the pipe lowered into the ground, SD as-built the pipe prior to the trench being backfilled. SD also had several crews on-call to asbuilt the pipe as the tie-ins were completed. This asbuilt information was compiled in our office and furnished to the client when the project was complete.